The Monkey braved the one-night transformation of Jalan Besar Stadium into Lucky Plaza to bring you these notes from Friday’s international friendly between the Lions, preparing for next Tuesday’s World Cup qualifier against Jordan, and the Azkals of the Philippines. 1. Worrying portents for the Lions… To Singapore coach Radojko Avramovic, the high-pitched screams that rang out whenever an Azkal player touched the ball in any remotely interesting position must have sounded like a chorus of harpies forecasting doom to come. Whatever the Serb tells the press after this match, his message to the players privately will be clear: if you start like this against Jordan, we’ll be two or three goals down at half-time. In the first half, the Lions were sloppy in the pass, loose in their defensive organisation and horribly pedestrian in attack – a quality-free display. The backline seemed determined to forge opportunity after opportunity for the Filipinos, especially after young Safuwan Bahrudin went off injured, while the midfield and attack struggled to maintain possession, let alone fashion a chance. Several players reverted to worrying bad habits previously presumed banished – for all that he was affecting the game in the first half, Shi Jiayi might as well have been sitting at the coffeeshop outside the stadium, while Shaiful Esah barely won a challenge. The loss of Safuwan is a huge cause for concern for Avramovic. If he fails to recover in time for Tuesday, the Serb will be forced to pull Hariss Harun back into defence – but that would rob the midfield of the energy and composure it so desperately needs. 2. But subs give cause for optimism. Thankfully, Singapore improved by leaps and bounds after the second half entries of Shahdan Sulaiman and Hafiz Rahim. Shahdan kept things ticking along in midfield and the Lions finally passed the ball around with a measure of confidence. The midfielder had previously failed to transfer his effervescent form in the S.League to the international stage, but the difference he made on Friday night was palpable. He even had an assist to show for his efforts, laying on Aleksander Duric’s goal for 2-0. Hafiz, still an international rookie, showed meanwhile that he remains a worthwhile experiment. A lot livelier than the disappointing Fazrul Nawaz in the first half, he was penetrative with his runs and was not afraid to test Philippines keeper Neil Etheridge. The Geylang United man looks capable of playing on the left as well as the right too. 3. Engine room poser. The lack of a driving force – through the self-inflicted loss of Hariss Harun – was a key factor in the losses to China and Iraq in the qualifiers last month. Hariss was back on Friday night, but it’s asking too much of even this outstanding young talent to slot seamlessly back into the team when he hasn’t touched a football for the last two months. His ring-rust was apparent – early on alongside his former SEA Games partner Isa Halim in central midfield, Hariss was somewhat tentative and his passing lacked the usual crispness. After moving back into defence though, he grew into the game and looked more assured as the match ticked on. Avramovic has an interesting dilemma for the Jordan game. Hariss and Isa would seem to be the intuitive choice, but there’s a question mark over Hariss’ match fitness, and he may be needed in defence if Safuwan is ruled out. The veteran Noh Rahman is a firefighting solution – had he the luxury of an extended preparation for these qualifiers, Avramovic might have been able to ease the Young Lions prospect Zulfahmi Arifin into international football. As it stands though Singapore’s lack of friendlies means that the Serb has to trust in experience, and Noh Rahman has plenty of that. On Friday he was quietly effective as a midfield screen, but the combination of him and Isa offer little in attack – and goals are a must against Jordan. 4. Warriors duo may have played themselves out of the first XI. With Qiu Li injured, this was a chance for Fazrul Nawaz to stake a claim for a place in the starting lineup. In the 24th minute, he violently thrashed a shot from outside the box high and wide, going on to flail a number of hopelessly optimistic shots wayward until he was hauled off for Shahdan Sulaiman. He also showed no sign of being able to read Aleksandar Duric’s flicks and knockdowns to forge a meaningful combination, something Hafiz Rahim appeared potentially capable of in the second half. Fazrul, on the fringes of the national team for so long, may be destined to go the way of Nodin Khalil – a 1990s byword for striking haplessness. His SAFFC team-mate Shaiful Esah meanwhile was a calamity in the making. Despite his goal – huge assist from the deflection by the way – Shaiful was easily the poorest player in a red shirt. So often out of position and left for dead by the Filipinos, he looked like he required a map to get back into Jalan Besar Stadium. His passing was loose as well, and in the 70th minute Shaiful nearly provided the perfect assist for James Younghusband when he headed a clearance straight to the Filipino at the top of the box. After he had put in a strong, disciplined performance against Malaysia at the Bukit Jalil Stadium, many (at least this monkey did) thought Shaiful had finally grown into the fullback we all hoped he’d become. But on the evidence of Friday night, he appears to be lapsing into bad old habits. Against Jordan, Avramovic may well consider Ismail Yunos or even Hamqaamal Shah to be a safer proposition. After all, how long can we justify Shaiful’s place in the team solely on the basis of his deadball delivery? I prefer Hamqammal Shah…he’s just not given the chance to start by Raddy. Able to start as both left back and left winger, he can probably added the energy going forward like a wingback. He controls the ball better than Ismail Yunos. However, he is no Yuto Nagatomo. Meanwhile, Ismail is slightly behind in my humble opinion. Despite his relative height, he is prone to fleet-footed opponents, showed in the match against Malaysia. 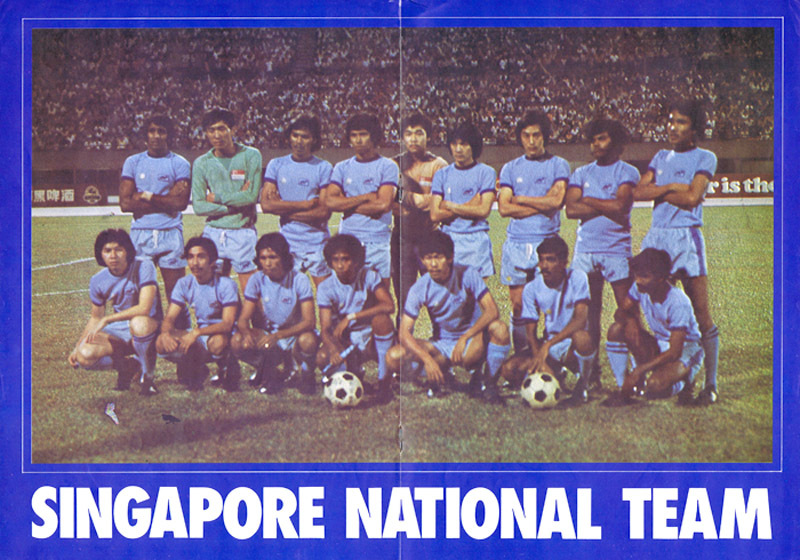 If only Tampines Rovers duo of Imran Sahib and Ismail Mokhtar are younger than they are now, they might have been called up by national team.